Acknowledgement - Source: photos, text etc. Our most humble thanks to all our Sai friends and fellow devotees for Sai Baba photos & textual matter, particularly to www. sssbpt.org - www. radiosai ,Heart2Heart Team (Prasanthi Diary) , Sri Sathya Sai Media Foundation for darshans & photo material and all the other official & public domain sources - Also, Various Sai Baba groups ,Forums & individuals etc. In addition, submitted articles, Darshan account, photos & Sai news by respective Sai devotees from all over the globe & SBOI group members to Group Saibabaofindia & www.Saibabaofindia.com website. Submit Sai news & Photos: mail to: saibabaofindia@yahoo.com - Text & photo source: Heart2Heart Team (Prasanthi Diary), sssbpt.org - radiosai.org - Sri Sathya Sai Media Foundation - h2hsai.org- saibabaofindia.com & SBOI group. For the last couple of days, Bhagavan has been granting long darshans in the evenings, pausing during His darshan rounds to interact with many devotees on the way. This evening, He also materialized vibhuti for some gentlemen in the Eastern side of Sai Kulwant Hall. Later, when He came to the verandah, He interacted with the team from the University Grants Commission which is visiting the University here, and materialized rings for two of them. Spending some time in the interview room and some time outside onstage, it was half-past six when Swami accepted Arati. Once He entered His car, only to emerge once again, move to the interview room again, and then return to His residence after ten minutes. Om Sairam dearest Sai family, The birthday of our beloved Lord was celebrated grandly at the Abode of our beloved Lord Bhagawan Sri Sathya Sai Baba. Puttaparthi, the holy abode which witnessed the birth of the Lord of this Kali age was blessed again to celebrate the 84th Birthday. Thousands thronged to this holy land and words are not enough to express the happiness among those people who were blessed to be born in the surroundings of this holy land.. It is a matter of pride happiness and contentment for all of us here and thousands come to Puttaparthi to wish the Lord of the Lords, the Lord who has neither a beginning nor an end. that Swami who is eternal and immortal it is only His immense grace and love for us that He allows us to celebrate 23November every year as His birthday..
Puttaparthi and its surrounding were jam packed. .All the streets were full and there was hardly any place even to stand.. The gents line touched Hanuman temple and people were standing in the lines since 2am in the morning. Inside it was the same scene. Stringent security arrangements were made for the big day and the mandir was beautifully decorated. Inside the Sai Kulwanth hall it was just beautiful. Birthday photos morning Picture slides. here was a big arch like thing on which 84th birthday celebrations was written.. It was announced yesterday that the birthday programme would start at 9:30am. Every one were eagerly waiting for our beloved Lord on His (body's) birthday. It was 9am and the Prasanthi Campus boys, primary school children with their bag pipers and Anantapur campus sisters with their full fledged band and vedam chanting boys were eagerly waiting for the Lord by His residence..
On the auspicious 22nd November morning, at the end of an hour long inspiring Divine Discourse , Bhagawan, praising His students, asked them to sing a song in unison! And they sang the famous song of Divine Romance, a student composition: “Hum Ko Thum Se Pyaar Kithna…” After the song Bhagawan said, His hunger was satiated. The Convocation Drama for the year 2009 that was staged on the 21st evenings was a pointer towards the Sathya Sai Model of Education, a model the world needs in the present times. …And on the heels of this Drama came the 28th Annual Convocation. The 28th Annual Convocation of Sri Sathya Sai University was held on the 22nd November 2009, in a glittering ceremony that had its grandeur, richly deserved for the yeomen service the University has been rendering in the field of education for more than a quarter century. In the evening, Swami came for darshan at 5.10 pm and after His round of the hall, He blessed a cake presented by the Hospital staff on the 18th anniversary of the Super Speciality Hospital here. He moved to the bhajan hall where the "Little Champs", the singers for the evening were seated and then to the interview room. He emerged from there to take a round of the verandah and sit onstage, talking to the Maharashtra Chief Minister there and calling up singer Smt. Bombay Jayashree to give a performance at 6.20 pm. After her half-hour performance, Swami blessed her and the accompanists with clothes and called up the five children who were to sing next. 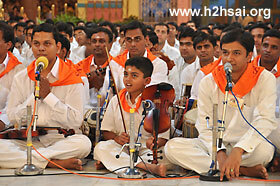 These children had sung before Bhagavan at Hadshi on His Maharashtra trip last month . After they sang for 50 minutes one by one, He asked for some songs with Swaras, and the two boys obliged. He then blessed them with shawls and the girls with sarees, interacting with them and listening to two more song by all of them together. This evening, the students of the Sri Sathya Sai University presented their Convocation drama. Bhagavan arrived for darshan at ten minutes to five and came to the bhajan hall where the students were seated in costumes. Interacting with them for a few minutes, He moved down the aisle and up the verandah to go to the interview room. From there, He emerged to come onstage and begin the presentation at a quarter to six. 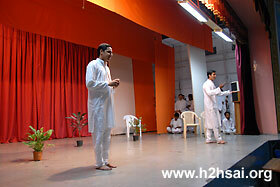 The hour-long drama 'Vidyaamrutam' brought out Swami's ideal of providing education free of cost, against all odds. This morning, Bhagavan came for darshan an hour after the nine o'clock bhajans began. He moved to the bhajan hall after three rounds of the ladies' side of Sai Kulwant hall selecting ladies for saree distribution, sending them to the bhajan hall. In the Bhajan hall, He gave sarees to the ladies gathered there. The students of the music college got a cake blessed since it was the anniversary of the inauguration of their institution. It was half-past eleven when He accepted Arati onstage after the distribution. November 19th has been celebrated as Ladies' Day by Bhagavan and all activities are done by ladies on this day. Smt. P. Susheela began the day by chanting the Suprabhatam at half-past five and the Vedam chanting before the Nagarasankirtan was also by Swami's girl students as on earlier years. The programme in Sai Kulwant hall began ten minutes after nine with Swami being welcomed by a procession consisting of the Anantapur brass band and Vedam chanting students. After His darshan round Swami lit a lamp onstage just before 9.30. After the traditional Rathotsavam in the morning, the packed Sai Kulwant Hall had to endure a long wait in the evening. This evening, the youth from Tamil Nadu presented their drama. 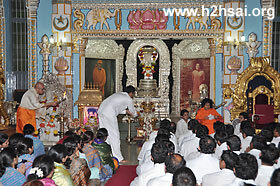 Bhagavan came for darshan at 5.50 pm and after His darshan round, began their 45-minute drama entitled 'Sathya Kathalu'. After the drama, some small girls who took part in it came up to Him with a card, and He blessed one of them with a chain. 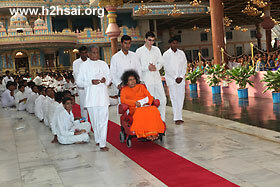 Clothes were sent for all the participants and Swami went down from the stage for group photographs. Even after He returned to the stage, He continued to interact with them till 7.15, when He asked for two bhajans to be sung with alap and then accepted Arati at half-past seven. He then visited the interview room for a short while before returning to His residence in the chair itself. 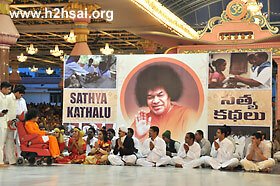 Read more details of Sri Sathya Sai Youth Pilgrimage 2009 13th to 15th Nov. 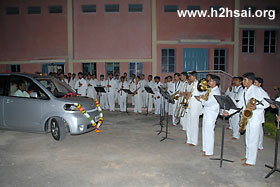 The youth from the state of Tamil Nadu were jubilant after a successful music programme the previous day. A music programme is usually considered a success when it enthralls the audience and they respond in a thrilled manner. In Prashanthi however, it is a success when the Lord beams with joy. And on those occasions when the programme achieves both, it is definitely a success! The youth had all reasons to cheer and that day, Swami had permitted them to stage a drama entitled, "Sathya Kathalu" which punned on the word Sathya meaning, "True stories" or "Stories of Sathya (our Swami)". The backdrop and actors were all ready by 3:30 p.m. itself and the Sunday crowd in the hall joined them as they awaited the Lord. The Veda chanting which began at 4:00 p.m. ceased at 5:00 p.m. and in the silence that prevailed, one could sense the prayers of the participants for His arrival. Swami arrived for darshan at 5:50 p.m. He was in a new chair and as always He looked beautiful! Moving through the ladies side, He arrived at the centre where He spoke to some of the participants as to the name and theme of the drama. Then, He moved to the gents’ side and completed the darshan rounds gliding past the students from the University and schools. Arriving on stage, He sat for a while listening to the Veda chanting. Then looking at one of the students in the first line He seemed to confirm, "Drama?" The boy nodded in agreement. 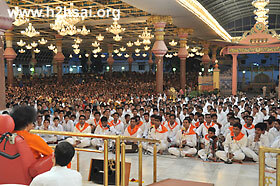 Swami asked for the Veda chanting to halt so that the programme could begin. 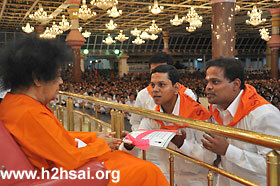 The initial offering of flowers and cards was made and Swami blessed them. 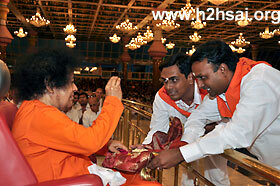 Then calling the State President of Tamil Nadu, Swami asked him to get the programme started with an announcement. So on the stage Bharathi is accompanied by the celestial sage Narada. The drama depicted true stories of transformation in three villages of the state. The first episode was in Karisangal where the Sai Youth abolish the stigma of untouchability and bring love and harmony in the society, winning the hearts of all in the village. The second episode depicted how the youth brought about harmony in the village of Malliankuppam torn apart by communal and caste segregation by the sheer power of Love. The final episode was thrilling for all to watch. Set in the village of Melakavetti, it depicted the fate of a poor person struck with paralysis. Everyone had given up on Subbayya and had reached a stage of cursing his wretched existence. The youth took up his case and nursed him daily with love and empathy. This inspired the villagers to come up with a proposal wherein one family of the village would take care of Subbayya for one day in a month. Slowly, that village transformed into an ideal Sai village. The climax of the story came when Subbayya gets a dream of Swami massaging him all over and the next day, during bhajans, he is completely rid of his paralysis! Witnessing the tidal wave of the Sai movement overcoming all obstacles and achieving the dreams he treasured in his poems, Bharathi is thrilled and overjoyed. Swami seemed very happy and pleased with the drama. His body seemed to quiver with emotion at the devotion exhibited by the youth tending to Subbayya. And when the bhajan, "Deena Dukhiyon Se Prem Karo" began at that very moment, many eyes turned moist in the hall. It was such a powerful message that to please Swami, one has to love and serve the sick and the forlorn. Seeing Swami emote is such an inspiring and powerful experience. When the characters in the drama nursed Subbayya and the bhajan was on, the mood of service pervaded the entire hall. 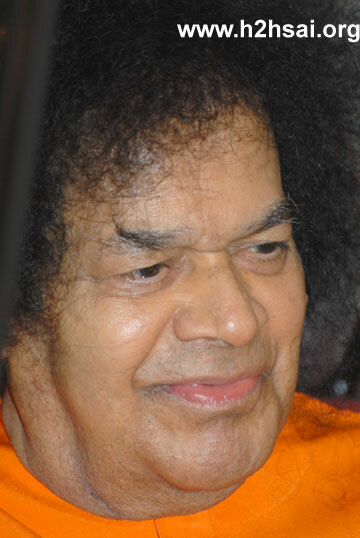 Swami's strong reactions when He seemed so touched at the marvellous service would have sprung the feeling in every heart that, "I too must do this in my own way and please the Lord!" The drama on stage inspires one to do well in the drama called life. Swami does not speak anything but the message is powerfully driven into every heart. As the drama concluded, there was a final song during which all the children and youth who were part of the drama made a formation in the front. There were two triads of girls who had acted in the drama. One of them belonged to the so called "untouchables" who had been touched by Him. Swami called them to the stage. 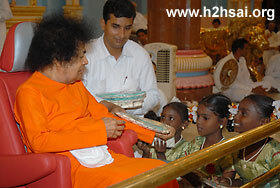 The Lord asked them their names and the girls after telling Him the names, asked Him, "Swami please come to Chennai." 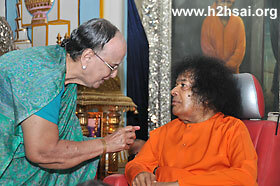 Swami - When should I come to Chennai? Girls - Come whenever you want Swami. Swami- I will come right away. Will you take me with you? The girls had no response and Swami smiled. He created a small golden necklace for one of the girls and put it round her neck. She was so lost and happy. Swami also adjusted it so that the pendant came in front. He asked for sarees to be brought and personally distributed them to the girls. Then He agreed to their request of padanamaskar after which He told them all to go down. He asked for safari cloth pieces to be distributed to all the participants and personally checked to ensure that all had received. Finally, Swami moved down the stage to pose with the children for a photograph. He guided the photographers to various points to ensure that all had been covered and He spoke to the participants as He moved up the stage. Arriving on the stage, He asked two students, "How was the song in the drama?" 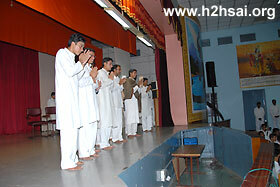 The students were appreciative of it and Swami told the State President and youth leader, "These boys are also singers. They sing very well in a good voice." He then asked them to sing two alaap bhajans. There was enthusiastic following for the bhajans. After the bhajans, He received aarthi. There was a gleam of joy in His eyes and blessed indeed are these youth for they granted Him so much joy. And this joy was not just the successful presentation of the drama but the tremendous service activity they had done in the villages of their state. Swami granted them abhayahastha at least 5-6 times and that spoke of the happiness He had experienced. Blessing everyone once again, Swami moved to the car and retired for the day as prasadam was distributed. The staff and their families from the Bangalore Super Speciality Hospital plan to come every month in batches for Bhagavan's darshan. 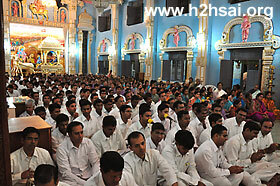 This weekend, the first batch of 120 members had come and were seated inside the bhajan hall for evening darshan. Swami came for darshan at ten minutes to five and after His darshan round, came into the bhajan hall as the bhajans went on in the Sai Kulwant Hall. He spent more than half an hour with the group, moving among them down the hall several times and later sitting in front of the hall to interact informally. Children's Day is celebrated in India on November 14, the birthday of India's first Prime Minister, Jawaharlal Nehru, as a tribute to his love of children. He was very fond of children and believed that children are the future of the nation. But in Puttaparthi and with Swami, everyday is Children's Day for that is what it becomes when the Universal Mother descends to foster and tend Her children. The youth from the state of Tamil Nadu had sought Swami's permission to put up a music programme and once that had been granted, they were ready in all eagerness. 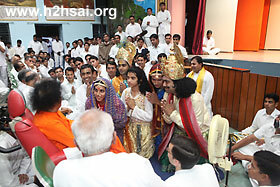 By 4:00 p.m., a portion of the marbled blocks had been occupied by these youth and everyone waited for Swami to arrive. 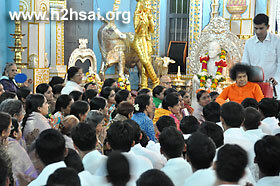 Swami came for darshan at ten minutes to five and completed the darshan round. There was another programme before the music programme. The staff and their families from the Bangalore Super Speciality Hospital plan to come every month in batches for Bhagavan's darshan and the first batch of 120 members had come and were seated inside the Bhajan Hall for evening darshan. 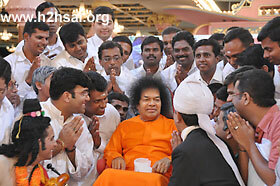 They had arrived as Swami's guests and Swami had agreed to grant them a group interview. The next half an hour or so turned out to be Childrens' Day for all these people assembled inside the Bhajan Hall and Swami moved up and down the aisles and 'paths made on request' granting namaskar and talking to them. 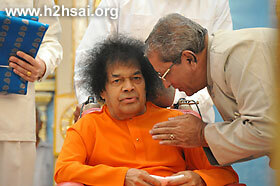 Thus granting joy to all of them, Swami moved out of the Bhajan Hall into the interview room. He sent word that all mikes should be kept ready and the youth should begin their programme. Even as they began the Aumkaram, Swami arrived on the stage and received the initial offerings of the flower and the card. The songs were strung together with a commentary and all of the songs were in Tamil. They were in different ragas and composed by many a great person. A very young violinist, maybe 12 years of age, was prominent in the front of the performing group. Every song was appreciated with loud clapping by the members of the audience. Once the songs were over, Swami permitted them to sing bhajans. As this went on, some of the youth presented Swami with their "Bhajan-Vikas" certificates which had been awarded to them for successful completion of Bal Vikas training along with training for the pursuit of music in general and bhajans in particular. Swami blessed the certificates. Another set of boys showed Swami the hard copy of the July 30th issue of an e-newsletter named, "Bhajanamrutham". Swami blessed it and keenly listened to all that they explained about it. Swami also called and spoke to another member of the group, this boy requested Swami for a group photograph and Swami said, "Not now." 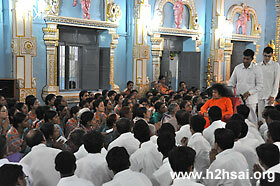 Swami then blessed everyone and asked for aarthi to begin. It was 6:50 p.m. when Swami finally moved into Yajur Mandir. "Be like a flute: a hollow reed straight, light, with no substance to hinder His breath. Then He will come and pick you up from the ground. He will breathe divine music through you, playing upon you with delicate touch." 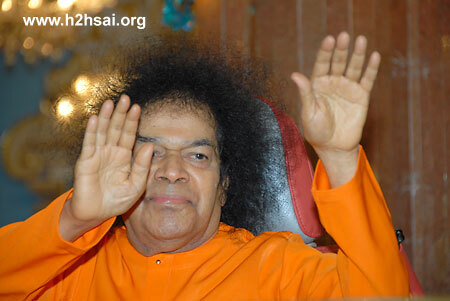 Bhagawan has always likened His ideal devotee to a flute that has no identity of its own, but is completely His. In case of Raviteja, an accomplished flautist and a former student of Bhagawan, the Creator not only blessed him with a flute in his hand, but also to play the melodious instrument in His proximity -- he is a member of the music group in Prashanti Nilayam. This morning, some cows to be donated to the Mantralayam temple were brought to Sai Kulwant Hall. When Bhagavan came for darshan during the bhajans, He blessed some of the cows. Later, after He came out of the interview room, the cows again came forward and Swami went down to bless them in the centre of the hall. This evening, He came for darshan in the car at a quarter to five and moved out to go to the college auditorium for watching the rehearsal of the Convocation drama by the students. 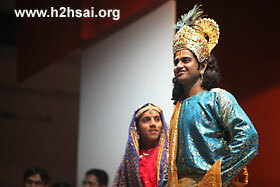 Returning at 6.15, He moved to the interview room and bhajan hall, coming to the stage area after 6.30 to accept Arati. The temple town of Mantralayam in Andhra Pradesh had been seriously affected in the recent floods. The temple of Sri Raghavendra along with all its property had been submerged. One devotee wanted to make a contribution of cows to the Goshala at Mantralayam and he prayed to Swami to bless the endeavour. Swami had graciously agreed. He arrived for darshan a little after 9:00 a.m. and as He reached the centre of the hall, He moved straight down to where a few representative cows had arrived. He had a look at the cows and went ahead with the darshan session. There were interviews which He granted after which He moved to the stage. From there, He moved down the Sai Kulwant Hall once again and towards the cows. He presented the cows to various recipients and was them for 15-20 minutes. After blessing the entire effort, He retired after receiving aarthi in the morning. 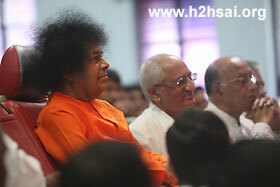 Swami had promised the boys the previous day evening that He would come to see the rehearsal of the Convocation drama. All the actors, set boys, backstage helpers and costume boys had assembled in the Institute auditorium by 3:45 p.m. and everyone awaited Swami's arrival. Waiting for Swami at the auditorium, one cannot help but notice the many changes that the landscape nearby has undergone. A new enclosure has been made for the peacocks. The lawns have been beautifully trimmed and a waterfall has been added. The greenery on the earth below was complimented by the blue skies filled with fluffy clouds. 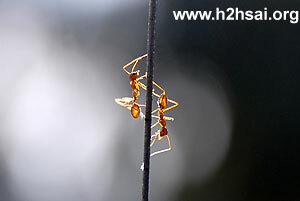 It was also fascinating to see a few red ants in their perpetual hurry, collecting food for the hard days to come! 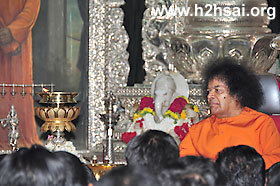 Swami came out of Yajur Mandir at 4:45 p.m. and headed straight towards the Institute. By 4:55 p.m., He was at the auditorium and was received by the Vice Chancellor, Principal and the Wardens of the Brindavan and Puttaparthi University hostels. As He alighted from the car, He gave vibhuti to the Vice Chancellor, Registrar and the Controller. Then He moved into the auditorium. All the backstage boys were ready, the actors in semi-costumes and everyone else associated with the drama were on chairs. Swami sat in the centre and asked for the rehearsal to begin. There were two narrators who began the drama and even as they were speaking, Swami asked, "Where are the actors?" When Swami sees a drama rehearsal, He conveys His comments and compliments directly sometimes and sometimes in a subtle manner. It is upto the students to grasp what He says and implement them. The next 50 minutes saw Swami in conversation many times with the warden of the Brindavan campus, giving Him feedback about the drama. The drama began. As the first scene went on, there were children in the background pouring water to potted plants. They were just miming with an empty bucket and mug and Swami asked, "What are they pouring? There is no water at all!" The scenes progressed and as the hero sings a song in Hindi, Swami asked whether the translation of the song would be available. The drama concluded and all the boys gathered at His feet, and Bhagavan began to pour feedback. "The drama should be more inspiring. It should inspire the public who are watching it with noble feelings. Feelings should arise spontaneously. And when you present all the goodness that Swami has done, people should also feel like emulating that." To a student who was donning the role of the demon king Hiranyakashyapu, Swami said, "You must be more vigorous and powerful in your actions and delivery. More rage and loudness has to be assumed." On the whole, about the drama He said, "Too many times the word money appears and there is emphasis on business deals." He wanted the tenor of the drama changed a bit and He was very insistent that a powerful message be conveyed through it. He blessed all the actors and had a look at the costumes too. Speaking about Rukmini, the consort of Lord Krishna, He said, "She was not involved at all. She too must speak and be involved in the scene." The boys were all thrilled at this involvement from Swami. It inspires everyone to be involved to the same level and intensity. Swami was happy with the efforts that had been put in. 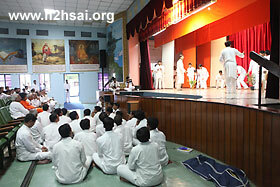 Having given joy and valuable feedback to all the boys, Swami moved out of the auditorium. 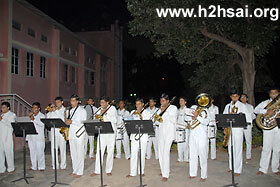 Aarthi was given and outside the auditorium, the new band leader requested Swami permission to play the slow march tune. Swami agreed and so the University brass band began to play as Swami moved out. It was almost 6:15 p.m. as Swami moved out of the Institute premises. Bhajans were on in the Mandir and after a couple of bhajans, Swami received aarthi and retired at 6:45 p.m. The Akhanda bhajan continued throughout the night and the loudspeakers were switched on at eight o'clock this morning. Swami came to the bhajan hall at a quarter to ten. He moved down the aisle, sat for some time outside on the Sai Kulwant Hall stage area, and returned to the Bhajan hall, remaining there till half-past twelve! He went to Yajur Mandir and returned at half-past five. Once again He moved down the aisle and sat for a while outside, then returned to the bhajan hall before six o'clock. Even after six o'clock, He kept indicating for bhajans to be sung, till He finally asked for the Arati ten minutes later. Prasadam of tamarind rice and sweet rice was then distributed to all on leaf plates even as Swami watched. He then interacted with some of the lady teachers who lead bhajans, gave them sarees, then gave sarees to some of the married men from the bhajan group for their wives. The interaction continued for more than half an hour, and it was 7.10 pm when Bhagavan returned to Yajur Mandir, blessing the devotees on the way. 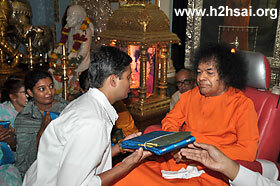 Last evening, the Karnataka Education Minister was here for Swami's darshan. 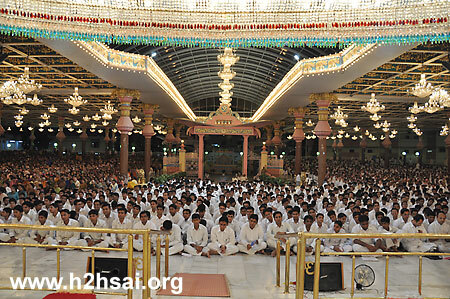 The 24-hour Global Akhanda bhajan began this evening at six o'clock. Today was also Bhagavan's birthday by the Telugu calendar. 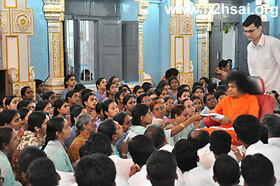 While He came for darshan at 4.20 pm, Swami called up several ladies and sent them to the bhajan hall. He moved twice around the ladies' side doing this selection before completing His darshan round. 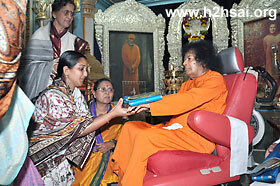 Coming to the Bhajan Hall, Swami distributed sarees to all the ladies, more than fifty of them. 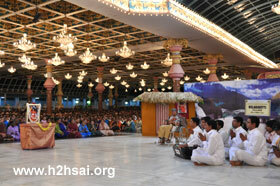 He then moved to the verandah and later to the stage area as the Vedic chanting went on. At half-past five, He came into the packed bhajan hall readied for the Akhanda bhajan. Interacting with some of the teachers and students there, He moved down the aisle and sat there till nearly six o'clock when He asked for the bhajan to begin and lit the 24-hour lamp. At half-past six, He returned to His residence, only to return to the bhajan hall at a quarter to eight. Once again He blessed the singers in the bhajan hall with His presence, moving down the aisle and taking a round of the Sai Kulwant Hall also. Finally, it was a quarter to nine when He returned to Yajur Mandir. From nine o'clock, the bhajan continued without microphones. The first major event in Prashanti Nilayam after Swami's memorable visit to Hadshi and Mumbai was the global akhanda bhajans. The 24-hour long bhajan programme has a long and interesting history. Like the springs that grown into mighty rivers, it too began in a simple, humble fashion and Swami was its chief architect. Read the first hand witness account of how Akhanda Bhajans began in 1945 from H2H Archives Click here. 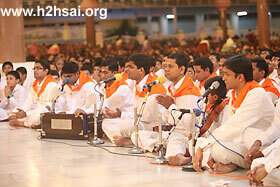 Presently this is a global event and devotees from more than 170 countries sing bhajans in many tongues. The whole earth witnesses the spread of holy powerful vibrations and the Sun, in its journey from the east to west, witnesses love pouring forth for the Universal Lord! Needless to say, Prashanti Nilayam is the epicentre of this spiritual seismic activity that measures a full 10 on the spiritually "Richter" scale! The evening of November 7 happened to be the day chosen for this year's akhanda bhajans. Swami arrived for darshan at 4:30 p.m. As He moved through the ladies' side, He seemed to be picking up a few ladies and telling them to assemble in the Bhajan Hall. As He completed that side, He took a detour towards the Mandir and once again moved through the ladies side, selecting some more lucky souls. Satisfied with the selection, Swami moved to the gents’ side and took a complete round. He blessed the birthday boys and took a round in the portico too. He sat on the stage for a while and then went into the Bhajan Hall and blessed all the ladies assembled there with beautiful sarees! The distribution took about 20 minutes after which, at about 5:10 p.m., Swami came out and sat listening to the Vedic chants. On His way out, Prof. Anil Kumar went near Him and regaled Him for some time and after that told Him something that seemed to touch Him a lot. Having sat out for some time, Swami went into the Bhajan Hall to enthuse those seated there in almost cramping positions so that they could see Him during the bhajans. He took a round in the hall and accepted many letters too. Coming out, He moved through the upper portico into the interview room. At 5:50 p.m., Swami was back in the Bhajan Hall waiting for the ticking clock to signal 6:00 p.m. At sharp 6, Swami lit the lamp placed in the centre of the hall and with that the Aumkaram began. The boys started the Ganesh bhajan and predictably, the second bhajan by the girls was Akhanda Jyoti Jalao. The bhajans then progressed. The hall outside presented a beautiful sight with all the lights being switched on. And the sight of all the boys and girls singing bhajans in unison thrilled anyone concerned about the future, for it is very rare to find youth today singing God's glory and aiming for higher pursuits of life. At about 6:40 p.m., Swami moved out of the Bhajan Hall, towards His residence. He went in the chair itself and all those singing in the ladies' side were happy for this bonus darshan. By 7:00 p.m., many started moving out of the hall and maybe they too planned to retire for the night. Quite a number however carried on the vigil with bhajans. At 7:45 p.m. came the adrenaline rush for those who had continued to stay in the Mandir. Swami came out of the Residence and moved into the Sai Kulwant Hall. There were just 8-10 lines on the ladies side and gents' side too and all jumped in joy at this special darshan. Swami moved straight to the Bhajan Hall and sat for the bhajans. Few minutes later, He moved through the Bhajan Hall and then to the portico. He came down the slope on the eastern side of the Mandir where the alumni sit. Taking a turn He made a full round in the students' area and accepted the hundreds of letters that were offered. Passing via the Primary School sitting area, Swami moved back into the Mandir. In the Mandir, Swami continued to sit for the bhajans. It was such an act of solidarity if we may call it so! Swami seemed to be saying, "Whether anyone stays or not, I will be there for you, with you, in you; loving and guiding you." Swami stayed till 8:45 p.m.! Even when He left, it was because He wanted the children to go and have dinner - fuel for the night long vigil! There is a section of people who take it as a special privilege to sing His glories when all others are asleep. The youth group from Hyderabad is an example. They arrive in the late hours of the night and remind people of God, 'awakening' many of them with their powerful and enthusiastic bhajans! 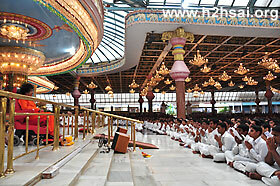 Different groups of devotees take up 45 minutes slots and ensure that the name is continuously sung. We cannot help but remember an episode from one of the earlier Akhanda bhajans. This was narrated by Mr. Eradi, from Kerala who currently to sings in the Mandir. In those initial days, there were just 4-5 singers from among the gents and ladies. They had a real difficult time sustaining the lead singing throughout the night. They were then wondering as to whether this practice was practically feasible for if anything happened to one of the singers, it would place tremendous strain on the others. At that time Swami told them, "You just wait. In times to come my students will line up to sing bhajans waiting for a chance to sing for me." That was in a time when Swami had not even set up a college! That is Avataric planning and execution! The morning saw Swami arrive for darshan in the car as it was raining quite heavily. Once again, the rains arrived just as they always do whenever there is any celebration in the Nilayam. Swami completed a round in the car and entered the Bhajan Hall. After a while, He moved through the Bhajan Hall and arrived on the stage to grant darshan to all in the hall. Swami sat outside for about 20 minutes and went into the Bhajan Hall where He sat for bhajans almost till 12:30 p.m.! As He sat for bhajans, and kept telling the students, both the boys and girls, "Go for lunch! Take some rest. Sing in batches." But none seemed to listen to Him (Who will leave the Divine Presence for food and rest? Maybe this is one Divine disobedience that is permitted!). As if helpless that none would go for food or rest till He left, Swami retired to Yajur Mandir at 12:30 p.m.
By 4:20 p.m., tractors arrived to the Mandir carrying the prasadam to be distributed after the bhajans concluded. It was after 5 p.m. that Swami arrived for darshan. As He neared the centre of the hall, He was requested to bless the prasadam that had been placed behind the Rama, Lakshmana, Sita statues area of Sai Kulwant Hall. 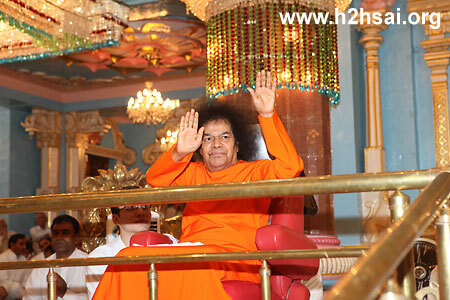 Swami moved down the marbled blocks and blessed all the vessels containing the prasadam. Then He moved up and back into the Bhajan Hall. Sitting for some bhajans, Swami began to move inside the hall too. decibel levels. As every year, the "who will have the last bhajan" began between the boys and girls! And Swami seemed to enjoy this "competition" as even at the stroke of six when the girls finished the bhajan, He asked the boys to continue. The girls would have thought that He was being partial but then after the boys finished the bhajan, He told the girls to continue. It was great joy and fervour when the bhajans continued. Swami did not stop there and bhajans went on till almost 6:15 p.m.! By then, it did not matter anymore as to who would have the last bhajan. Swami then received aarthi and needless to say, the clapping reached deafening levels. After the aarthi, leaves were distributed for the prasadam to follow. Swami seemed to encourage all to eat well! After a loud Brahmaarpanam prayer, the boys began to feast! Then, He called out for all the Anantapur ex-students and singers who were married. 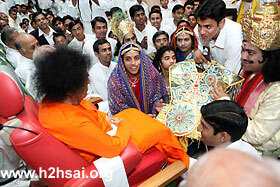 As they assembled at His lotus feet, Swami distributed sarees to all of them. They were positively and pleasantly shocked! After that, He asked as to who among the gents' side had also been married and He blessed them too with sarees for their wives. He teased a few boys saying, "No wife, no sarees!" It was then that He called for Jayamma Madam, formerly the Principal and the Warden of the Anantapur Campus of the University. He told her that all the children in the hall were gold. She got a ring blessed by Swami. Swami then began to narrate about the devotion of Jayamma and her late husband. He also praised the devotion of her father, Mr. Vitthal Rao. As this was going on, the Primary School students too began to chant the prayer from outside. It was very loud and Swami smiled as He said, "Competition!" He saw the empty leaves of a few students in the front and asked for them to be refilled with food. Granting this supreme joy that comes with Divine intimacy, Swami retired to Yajur Mandir at 7:00 p.m.
"...Welcoming the Lord back to Prasanthi is never an ordinary occasion, rather is a momentous occasion to reconnet, for Prasanthi or Puttaparthi can never bear the pangs of separation from ‘her’ Beloved. This is the history of her very existence and the existence is the Divine Being Himself, but for whose presence the spiritual township goes barren. This time the ‘gap’ was just less than a week, precisely six days, and Prasanthi was ever jubilant with floating devotees making life active. Watching over the activities at Pune and Mumbai, Prasanthi has been updating the events of her Beloved and eagerly awaiting the day, 2nd November to dawn faster. "...the Mumbai venue was packed with a capacity crowd of over 25000 gathered at the Jamboori Maidan for Bhagawan’s darshan. Bhagawan entered the stage around 11.10 a.m. and remained there for about 30-35 minutes when bhajans were held while the capacity crowd was feasting their eyes with Bhagawan’s Darshan. Bhagawan left the venue after receiving Mangala Arathi at 11:45 a.m. The talented musician and former student had the great fortune of accompanying Bhagawan on His trip to Pune and Mumbai, and has shared his 'divine' experiences. The whole adventure began on October 4, 2009. Evening bhajans were on at Prasanthi Nilayam, and the mellifluous voices of Swami’s students were enthralling the devotees and had filled the whole atmosphere with divine vibrations. Swami was sitting inside the interview room of the Mandir -- just as He sits in the 'inner room' of His devotee's hridaya mandir (hearts). Suddenly Harish, who escorts Bhagawan in the Mandir, came running towards our bhajan group and signalled in my direction to sit outside the interview room. Excited and afraid, I immediately stopped playing the flute and sat in the Mandir's portico wondering what would happen. I even considered if I should call my family as well for the interview. After a while, Harish came back and indicated the number four with his fingers. I was confused by what that meant. That is when I realised that four of us -- Prabhakar, Arvind Sai, Nishikanth and me (all members of the bhajan group) -- had been asked to sit outside the interview room, and not just me. 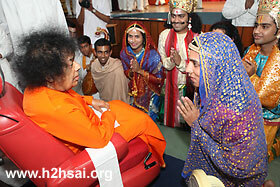 Swami watched us as each of us entered the interview room and spontaneously burst into a beautiful smile to greet us. We quietly sat at His lotus feet with our eyes fixed on His 'Sundara Vadanam' (beatific face). Suddenly, Swami drew out notes of Rs 500 and gave two of them to each of us. Then with a twinkle in His eye and with a tinge excitement in His sweet and soft voice, He said, “Stitch new clothes for yourselves. We are going to Pune. They have built a new temple there on 200 acres of land on top of a hill. I will take you in the flight, direct from Puttaparthi to Pune." Needless to say, we were very thrilled with this wonderful announcement and immediately began with the preparations towards Swami’s trip to Pune. In the days that followed, Swami selected a total of 28 students, most of them being “music boys”. This was a clear indication to us that there may be a few music programmes scheduled for us in the trip. So we, the music boys, began drawing up lists of devotional songs that we could present when Swami asked. The process was not simple -- it involved long practice sessions and intense discussions, mingled with, no doubt, some apprehension and excitement. As October 28, the day of our flight, approached closer, we spent most of our waking hours in practising our songs, harder and harder. We compiled many song lists by juggling the songs, the order of songs and the style of singing to suit the different kinds of audiences and locations. Above all, our priority was that the songs should be liked by our beloved Swami. We also drew up a tentative order of songs that we could render in case we were asked to present a musical session on the spot. Additionally, since we were on our way to 'Sri Sathya Sai Panduranga Kshetra' in Hadshi, we asked one of our brothers to write a song dedicated to the new mandir in Telugu. We set the tunes for the lyrics written and were ready to present it too at the earliest opportunity given to us. Swami and we reached Hadshi on October 28. We learned that a concert had been organised for the same evening where well-known singers Kavita Krishnamurthy and Nitin Mukesh would be singing among others. We anticipated that Swami would ask us to perform soon after their programme ended, but that did not happen. 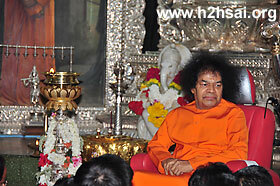 The next morning, Swami inaugurated three temples at Panduranga Kshetra, and blessed with a discourse in the evening. We expected to be called for a programme that evening, however Swami decided otherwise. We continued to practise our songs every evening, expecting to be called for a programme anytime. Also, we were praying for an opportunity for some private moments with Swami when we could offer some of the songs. We stayed in Hadshi for almost three days, and were asked only to sing bhajans on different occasions. The morning of October 30 is very memorable for all of us, when we were rushed to the stage before Swami arrived and were asked to start the bhajans. Swami arrived and sat on the stage for almost 45 minutes, as all of us sat next to Him offering our heart-felt bhajans at His lotus feet with complete devotion. With a cool breeze wafting by, with thousands of devotees partaking the bliss of the nectarine bhajans and with Swami showering His love and grace on all, it was indeed a very satisfying morning. In the evening of October 30, child participants from the television show Little Champs presented a programme, and we again waited for Swami's call. But I assume we were not destined to perform in Hadshi at all. However, in the night, Swami sent a message to us saying that we should be ready with a music programme on November 1 to be presented at Brabourne Stadium, Mumbai. Swami had also specified that we were to present only classical songs and ones that contained ample “sargams". As soon as we received this message, out excitement rose high and we decided to practise the songs the next morning before we left for Mumbai. Meanwhile, we compiled the final list songs that we would render and began our practice. However, with the tight schedule on 31st morning, we did not have sufficient time to practise all the songs. On October 31, we reached Mumbai in the afternoon, and Swami gave darshan at the NSE grounds, Goregaon, for over 50,000 devotees that evening. Bollywood singer of fame, Sonu Nigam, performed at the darshan and Swami liked his performance, and also presented him with a ring. Even then, we were expecting Swami to look at us and signal at us to perform right then. But this did not happen. As students of Swami, we have learnt a significant lesson: One must always be ready to do anything that Swami wants, at any time. Swami may suddenly ask someone to speak, to sing a song or a bhajan, regardless of the situation or occasion. If you shied away or offered excuses, you would have missed an opportunity of your life time to please God. After all, we are living only to please Him. From then on, we were always prepared to present the programme, just waiting for His call. We carried our musical instruments everywhere Swami went, expecting Him to ask us for a bhajan session or music programme anytime. At every spare moment that we got in Mumbai, we practised our notations, working on our song presentation techniques and were constantly involved in discussions on ways to improve ourselves. At the same time, we thoroughly enjoyed every minute of our stay in the divine proximity. On the night of October 31, we sat together for a thorough rehearsal – to fix the loose ends, finalise the improvisations and to finetune our renditions for the programme scheduled on November 1. Our practice session went late into the night as we thoroughly rehearsed every song. We were excited, and also tensed; in fact we had a chilling sensation down the spine. The programme was just 24 hours away, and we were anxious about performing in the presence of God, and thousands of His devotees in an open stadium. The true cause of the anxiety was not the performance, but about meeting the expectations of His devotees as being 'Sri Sathya Sai Students'. As we were representing ourselves as Swami’s students, we just could not afford to be anything less than the best. On November 1 morning, Swami called our group member Aswath Narayan during breakfast session, and reminded us to be ready. That morning, Swami gave darshan at Jamboorie Maidan, Worli, and proceeded to the Maharashtra chief minister’s bungalow. Swami then went Sri Gokul Das’s house, which is located near Brabourne Stadium, from where we were taken for a brief sightseeing tour covering the key places in Mumbai. We were then taken to a nearby hotel for freshening up and were later brought to the Brabourne Stadium for the evening darshan at about 5 pm. 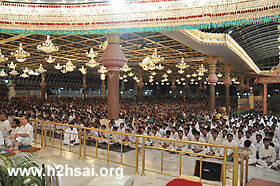 The stadium was packed with over 20,000 devotees eagerly waiting for Swami’s darshan. After reaching the venue, we went up the stage to arrange our instruments and microphones for the performance, after which we came down to sit in the places allotted for us. Devotees from Mumbai were rendering bhajans, and the whole atmosphere was charged with excitement as Swami was expected to arrive any moment. Swami came at about 6 pm and went up on the stage. As soon as He sat on His chair, Swami asked one of the organisers to announce that students of the Sri Sathya Sai University would be presenting a music programme. We got up to take Swami’s blessings. As a prelude to the performance, Swami asked us to sing two bhajans before we began with the classical songs. Accordingly, we began with the bhajans -- and this not only charged the atmosphere but also gave us a shot of confidence we needed. Sri Ravi Kumar began with the classical session with the song 'Deva Namo Deva', followed by Sri Sai Krishna's song in Hansdhwani Raga and 'Shiva Shankari' by Aswath Narayan in Darbari Kanada Raga. The singers got completely immersed in their songs, which touched all the notes perfectly. The microphones and the open stadium enhanced the sweetness and majesty of their voices, while the entire audience was lifted to a reverie. To our and the audience' elation, Swami too clapped in appreciation after each song. Every singer and every instrumentalist rose to the occasion and there was perfect harmony in every rendition. After presenting five songs, we paused for Swami’s reaction. As if to say He was extremely happy, Swami said “Sing one more song... ” looking in the direction of Sri Aswath Narayan and Sri Srinivasan. The two singers presented a Thillana in Ahir Bhairavi raga together. The fast pace, the rhythmic complexities, and the melodious improvisations in this Thillana left everybody in the audience stunned. Ravi Kumar then started the Qawali 'Tere Dar Pe Jo Bhi Aaya…” (O Sai Baba, you have answered the prayers of every person who has knocked your door...) and was joined by the other singers and instrumentalists as chorus. The lyrics of Qawali, the purport of which is 'O Sai Baba, you have answered the prayers of every person who has knocked your door', was most suited on the occasion. Swami too seemed to be emotional and was filled with happiness. Needless to say, the audience was ecstatic and kept tab with the beats. After we had presented seven songs in total, Swami said “Enough”, and we all went up to Swami to surrender ourselves at His lotus feet in gratitude to the wonderful opportunity He had given us. Swami was smiling all through and repeatedly said, “Chaala Baagundi” (Very nice in Telugu). He then blessed us with clothes and group photographs. The next morning we left for Puttaparthi after a happy lunch. As I look back now at the whole adventure that began on October 4, everything that happened seems perfect. The whole music group is extremely satisfied, as we feel we have offered our best to God, and God too seemed very pleased with our humble offering. Every talent is a gift from God. However the talent gets its true worth only when it is offered back to Him with humility and devotion. And when God Himself expresses His satisfaction with the offering, what else does a musician need? That, in itself, is the fruit and fulfillment of the talent.